I am very scatter brained. I tend to start one thing, then leave it for another. This is such a curse when it comes to housework! A perfect example of this was yesterday - I started organizing the kids bookshelf, then remembered I needed to start a load of laundry. So, there are boxes of books for me to deal with today. DH sometimes calls me his Edith Bunker, lol. I love old movies! From Bringing Up Baby to The Searchers, I love them all! It's funny because my kids watch these flicks with me and have no idea they are watching movies 40+ years old. When Tristen found out John Wayne was dead he was heartbroken! I love to cook and try new recipes. Not having a range has been quite a challenge for me. But, we have tried some great crock pot recipes the past few months! I cannot wait to be able to start baking again, because it is one of my favorite things to do! I love to write letters! In this age of email, it's almost becoming a lost art. Nothing brightens my day more than to get a heartfelt letter in the mail. Even a short, simple note can make someone's day. I have several pen pals in Iraq at the moment and I really enjoy writing to them. I hope that I can be a bright spot in their days. DH and I are hooked on the Sci Fi Channel's Ghost Hunters show. We love it! One of the highlights of our week is when the newest episode is available to watch online. We snuggle in bed with a bowl of popcorn and watch together. Good times! I have a serious addiction to THe Sims 2. It's scary! I can sit down to play for just a few minutes, but end up losing a lot of time. I've actually started setting a timer. I thought I was some oddball, but I've found quite a few Mom bloggers that share my addiction. It's nice to have a fun way to unwind. Plus my kids think I'm super cool! 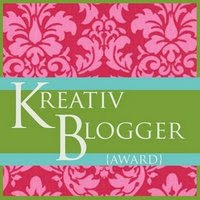 Now to pass the award on to other bloggers. Bella Casa ~ Beautiful Home - This blog is a treasure I discovered just over a week ago thanks to Entrecard. It has quickly become a favorite! The Jolly Kitchen - This seems to be a fairly new blog and I'm so glad to have discovered it! It has some of the most clever recipes I've ever read! The $200 Mission - Okay y'all know a blog on spending $200 a month or less on groceries is going to be one of my faves! Awesome recipes, deals for us frugal minded folks, and a great writing style blend into a great blog! Full Bellies, Happy Kids - I've been an off and on reader of this blog for awhile. I'm terrible about just bookmarking things, or thinking I'll remember the sites I love. Anyway, the only word for this blog in YUM! You really need to see the recipes! All four of these are fantastic blogs! I urge you to stop by, check them out, and tell them Nessa sent ya. Aw - thanks for the award and the kind words! I just found your blog recently and I've really been enjoyng it too! Thank you SO much for the award! I will get it up soon. Your blog is great too! You are so sweet to give me this award! I will put in on my site as soon as I can.